Ed has lived in New Hampshire since 1977. 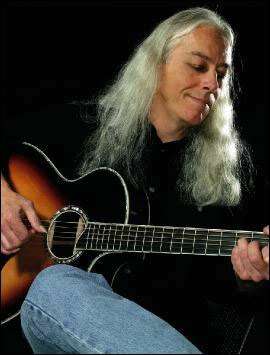 His song “The Handing Down” was included on Windham Hill’s first Guitar Sampler. He has played on recordings by Arlo Guthrie and Jorma Kaukonen, and on the soundtrack of two Ken Burns documentaries, “Mark Twain” and “The National Parks: America’s Best Idea.” His ninth and latest album, There and Gone, is a mix of intricate originals and compelling covers, including “I’m So Lonesome I Could Cry” and a clever pairing of “Imagine” and “Across the Universe.” Premier Guitar compares the slowly unfolding tunes to “flower petals opening to the sunrise.” If you like virtuoso guitar playing, this is the show for you.